Big Challenge! 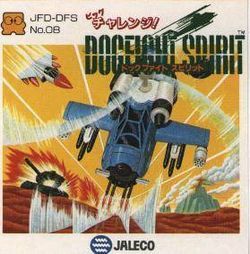 Dogfight Spirit (ビッグチャレンジ！ ドッグファイト スピリット, Big Challenge! Dogfight Spirit?) is an overhead vertical shooter developed for the Famicom Disk System and published by Jaleco Entertainment in 1988. It is the second title in Jaleco's "Big Challenge!" series. The player controls a blue helicopter fighting against waves of enemy vehicles and ground turrets. Each mission takes the helicopter to a different part of the world. The game's power-ups, available by destroying smaller supply trucks driving across the screen, change the helicopter's weapons but do not make them stronger. It's even possible to collect the weaker original weapon again if the player is too careless. These range from a stronger forward-firing cannon (or laser) to guns that spread fire forwards and to the sides of the helicopter. This page was last edited on 27 October 2014, at 02:16.